← Rhizomatic weapons? No thanks. I was curious about how deep I would dive into the ideas of Deleuze & Guattari, in particular after the discussion started by cathellis13. And after a few pages I realized that it won’t be too deep. Just as Wenger says he did not want to enter the community of practice of the wine connoisseurs who know what “purple in the nose” means, I do not really want to know in detail what the “purulence of the nose” (p. 285) has to do with the philosophical subtleties I am not trained in. But on a more superficial level, some interesting stuff caught my eyes which aligns well with my understanding of both Connectivism and McGilchrist’s book about the Making of the Western World. means for me, ask about the connections rather than the nodes. Similarly, my take-home from McGilchrist is that the West has too much relied upon one of two basic modes of brain operation: the one that is focused on isolated, fixed, static, abstracted, decontextualized items to be grasped, collapsed and wrapped into nested boxes, while the other one caters to the interconnections, relationships and contexts. this is again quite compatible. Is this comparison too simple, is there a fallacy? I would love to learn from other course participants if it makes sense to them. This entry was posted in rhizo14 and tagged rhizo14. Bookmark the permalink. I think that’s a nice comparison, and it definitely makes sense to me. The tree like structure of my hard drive really does not suit the way I remember things, and you just reminded me of why this is a problem – because I remember rhizomatically, not arborescently, a lot of the time. Jenny, many thanks for the links which I will follow soon. “the idea of community with it’s focus on social learning (i.e. nodes), doesn’t fit easily with rhizomatic learning.” I had not thought about whether nodes might be totally missing in rhizomes. Until now I thought rhizomes were just an alternate metaphor for a network, just a bit more ugly and messy. But perhaps you are right and they lack network advantages altogether. Sarah, I am very happy about your versed opinion. If you, in turn, want some thoughts by an IT person about your hard drive problem, you might want to take a look at this and this. Jaap, thank you very much for your visit, and for your advice which is certainly helpful in many many cases where I know a suitable search term. Unfortunately, I often don’t remember a proper search term. I wonder if D & G would see this search term as a circumscribed, arborescent, identity? The proper search term is difficult, if you know the term the search is almost done. It may take some searches to find the right search term. (You R not alone in this) D&G would not care for a right search term, any term will in the end, give a result. 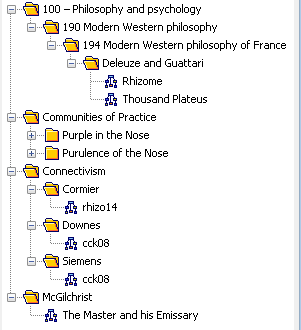 The rhizome is endless. Heli, thanks for the alert and sorry for the mistake. It is corrected now.